As you jet away for the Easter break, are you one of those sitting on a packed aeroplane lamenting the glory days of aviation? With more of us flying than ever before, demand for low-cost airfare has pushed many airlines to look for ever more ambitious ways to save costs and pass them on to the consumer. But has this really led to worse travelling conditions? Many people would say yes, but knowing what we do about commercial airliners, we’re taking a closer look and debunking some of these myths. Air travel is the safest form of transport known to man. There were 1.25 accidents for every million flights last year. However, back in the ‘good old days’ air travel was quiet a risk. The 1950s and 60s saw around six fatal crashes a year in the US alone. There’s no doubt that despite the huge rise in passenger numbers, it’s far safer getting on a plane today than it ever was in the past. In the ‘good old days’ a ticket from London to New York would cost the average person their annual salary. That’s why you didn’t see many ‘average people’ on aeroplanes. Today, a return ticket to JFK Airport from Heathrow will set you back just 1% of an average persons’ salary. Modern air travel has opened the skies to millions of people. 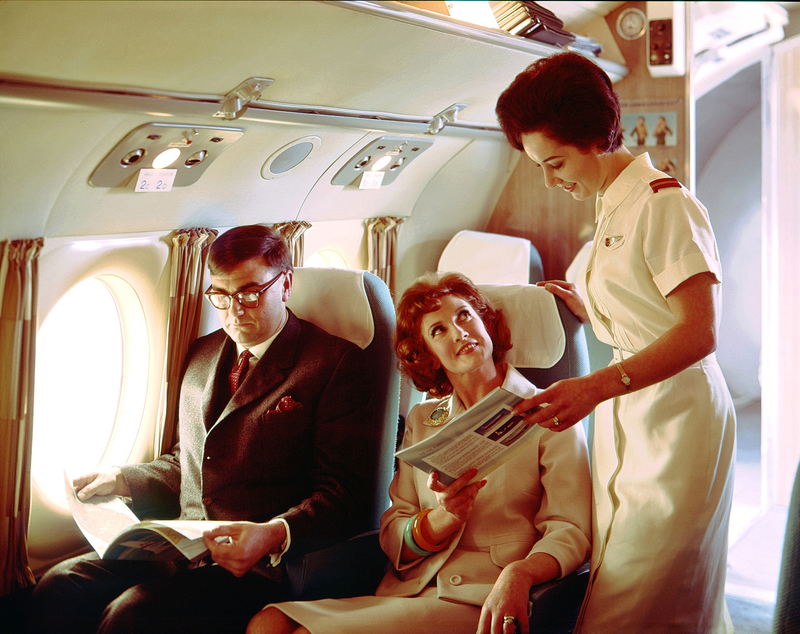 On the face of it, the days of classic air travel where streets ahead of today. Many cabins resembled 5-star hotels and three-hour long boozy lunches were the norm. However, smoking was commonplace, and the cabins were thick with tobacco fumes. prone to being forced to land during bad weather. Today’s cabins are not only more protected from outside conditions, but also filled with entertainment such as WIFI and in-flight entertainment channels. We recently saw the first non-stop 17 hour flight from London to Perth. Compare this to the 1940s, when a flight from Brisbane to London could take up to two weeks and include 43 stops. And don’t forget that we are also about to enter a new age of hypersonic air travel. You’ll be able to travel from London to Sydney, faster than it currently takes to fly from Gatwick to Malaga. Ok, so we have to hold our hands up here! Flying used to be a luxury experience for the well-heeled only, and as such it was a much more glamorous affair. When people flew in the past they wore their best outfits. It also wasn’t uncommon to see ladies’ poodles with their own seat. It’s a far cry from today’s cabins, packed full of tracksuits, trainers and tank-tops. Travellers dress for comfort not style. So, there you have it, despite being lumped in with hordes of other travellers, you have to admit that today’s air travel experience is faster, cheaper, safer and less boring than that fabled golden age of air travel. Blue chip airlines like BA and Virgin may have had to change their approach to deal with competition from the rise of budget airlines, but on the whole we have more choice, more comfort and more convenience. That has to be something to cheer you up as you file through the sheep pen with your shoes in one hand and belt in the other on your next flight. To find out more about JP Aero and how we play a leading role in the aerospace supply chain with our range of aerospace, industrial, vintage and historic and bespoke fasteners contact us today on +44 (0)208 504 8833 or get in touch via email: sales@jpaerocom.co.uk.